It's amazing how ingrained Facebook has become in our lives, personally and professionally; as consumers and as individuals. When a business doesn't have a website, it's surprising, but when it doesn't have a Facebook page, it's straight up dumbfounding. Facebook pages, like most social media profiles, are free, easy to set up and use, and to a degree, level the competitive playing field for businesses -- why wouldn't you create one? For those that have, it can be extremely frustrating when they don't see success just as easily as the set up was, but there is hope. While some brands do seem to get Facebook for business right from the beginning, in most cases, Facebook engagement doesn't come quickly thanks to the platform's algorithmic timeline. Are People Seeing My Brand's Facebook Posts? 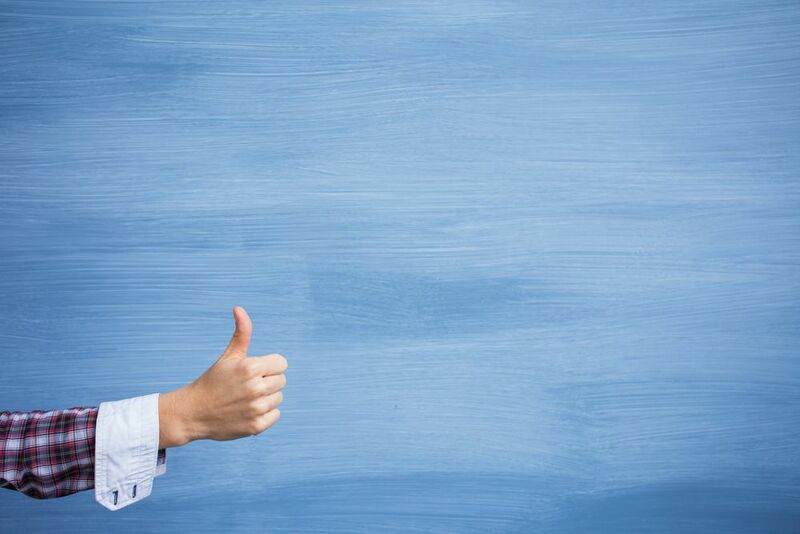 The bad news is fewer people see your company's Facebook posts organically than in the past. Each like, comment, and page view is tracked and then fed into a fancy algorithm that continues to personalize a user's feed in order to optimize their experience. So that band you streamed yesterday? Hello! And that company page liked three months ago? Goodbye. This is incredibly frustrated for marketers, especially if your brand worked hard to build up a following of thousands of Facebook fans. Now only a small fraction of those fans will see your posts in their timeline organically. The good news is you can make moves to change that. Essentially, Facebook has moved to a "pay-to-play" model, meaning you have to pay to promote your posts if you want to guarantee they are seen by your buyer personas but don't give up on Facebook just yet. Luckily, Facebook advertising is one of the most cost-effective ad platforms ever. Using it, you can ensure your posts are seen by exactly who you want and in turn, improve your Facebook engagement. 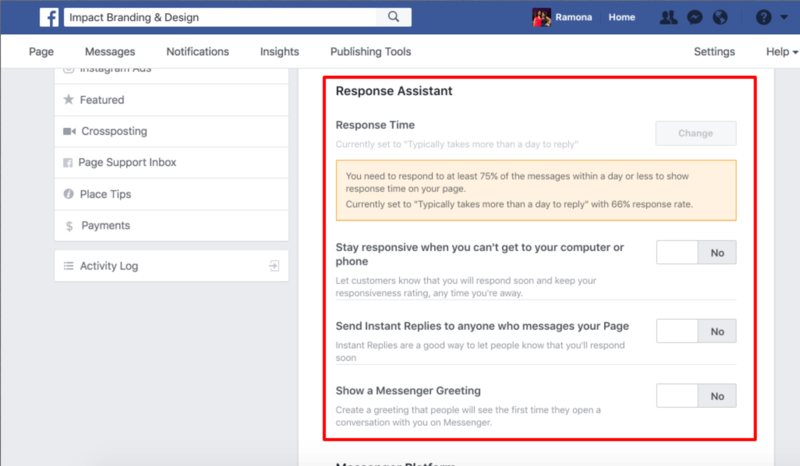 Below is a screenshot from Facebook's Help Center showing you how they define engagement rate and how you can analyze your page's engagement using Facebook's Insights dashboard. *Note: Your brand's Facebook page will need to have at least 30 likes before the Insights tab is available, so don't panic if you just created your profile and don't see it yet. Need ideas for the types of Facebook posts worth boosting? Check out these 11 ways to boost Facebook engagement provided by Social Media Examiner. Like all inbound marketing tactics, there's a right way and wrong way to market your business on Facebook. Ignoring the best practices can end up wasting a lot of your valuable time and causing your business to miss out on potential sales. Fortunately, we've got all the information you need to do things right. Take a look at the following Facebook do's and don'ts explained by former IMPACT Inbound Marketing Consultant, Dave Sotolotto. Now, every audience is different and may respond to different things, but if you're just starting out, the best practices are likely to set you up for early success. Once you've established your presence, feel free to experiment with different types of content, imagery, etc. Now that you're familiar with the basics of Facebook for businesses, let's dig deeper into how marketers unlock the full potential of their Facebook marketing. The point of social media is to be "social" and if your brand isn't connecting on a human level, you're failing on Facebook. Use your page to humanize your brand and be more relatable to your buyer personas. Social media is all about having a two-way conversation with your prospects and customers. Asking questions is one of the easiest and most-effective ways to increase Facebook engagement and gain valuable insight from your audience. We've already mentioned this, but it's worth repeating because visual content really is that powerful on Facebook. Include an image, video, or even gif in every post! These visual aids will grab your audience's attention more effectively than text alone would in a newsfeed. 5. Give the people what they want! User-generated content is great for Facebook engagement and saves you the trouble of creating the content yourself. 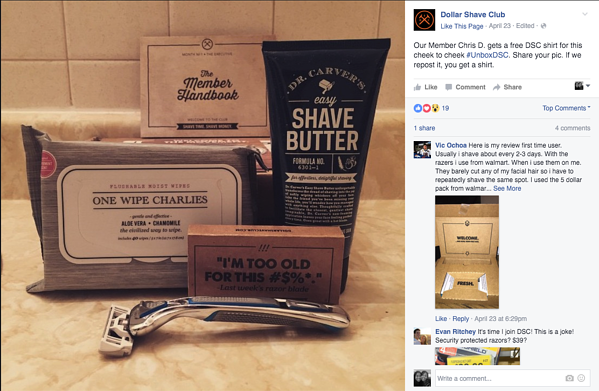 Dollar Shave Club, for example, regularly encourages its customers to share photos of their purchases in exchange for freebies. Check out these 6 ways to collect user-generated content from Facebook to start using content from your brand's Facebook fans. Sometimes the Facebook posts that get the most engagement are the simplest ones with a minimal amount of text or imagery. So, there's no need to talk your audience's ear off.The key is understanding your buyer personas and tapping into certain phrases and ideas that resonate with them. A few carefully chosen words are better than a rant. Success with Facebook marketing doesn't happen overnight; it takes time. Increasing your Facebook engagement requires the persistence to be active on the platform day after day. Social media is a serious marketing tool, but that doesn't mean you need to act serious about it. Have fun with it! Create a funny meme. Chime in on pop culture trends. Act like a human that's having fun and your fans will be more likely to engage with your page. Kristy Schnabel posted an interesting case study not too long ago about Facebook Engagement Ads. Her client wasn't satisfied with her results from Facebook Advertising, so Kristy stepped in to make some changes to the ad. The first thing that stands out about her ad is the image. Kristy purchased a premium stock photo to use in the ad. Having an eye-catching image is crucial, so if you can't find a high-quality image that fits your ad from a free stock photo site, you should probably bite the bullet and purchase some quality stock photos. The next useful thing she did is introduce the blog post in a way that resonates with her buyer personas. So she gets your attention with a nice image, then immediately lets you know if this content is for you or not. At the end of the text, she includes a CTA to read the blog post and includes the full URL to the blog post. 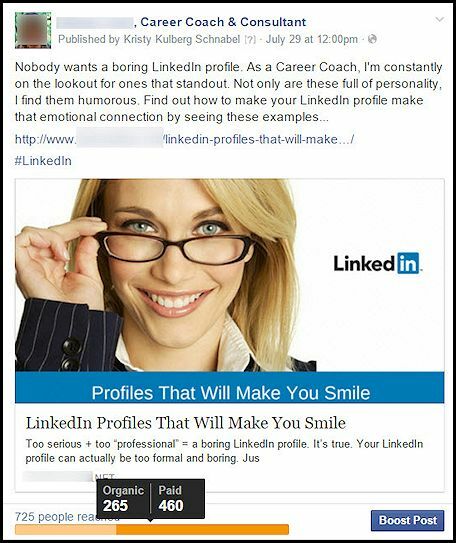 Her CTA is effective because it peaks your interest without revealing what you will learn in the content -- "Find out how to make your LinkedIn profile make that emotional connection by seeing these examples..."
Below are two more great examples. This ad from Girls Who Code includes a video, making it even more engaging. 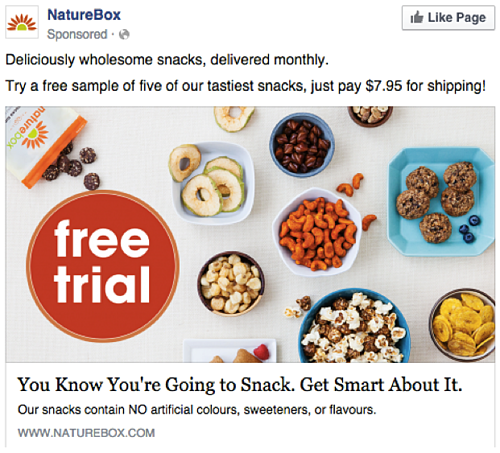 NatureBox makes great use of an eye-catching image and a clever headline to capture your attention. This article will help get you started with Facebook Ads. While YouTube is still the biggest video content platform on the internet, Facebook has the advantage of being the largest social media platform overall. Since native content (content created on the platform you're using) typically performs much better, you're more likely to increase Facebook engagement with Facebook video -- and that goes double for a Live video. Facebook has openly reported that its algorithm gives preference to Facebook live videos in newsfeeds so you'll want to take advantage of it. 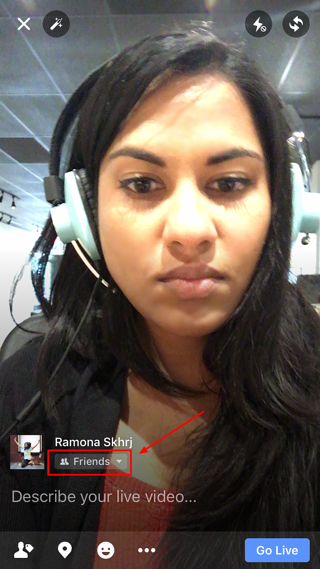 HubSpot wrote a great guide to Facebook Live that explains in detail how to get started, but here are the basics. 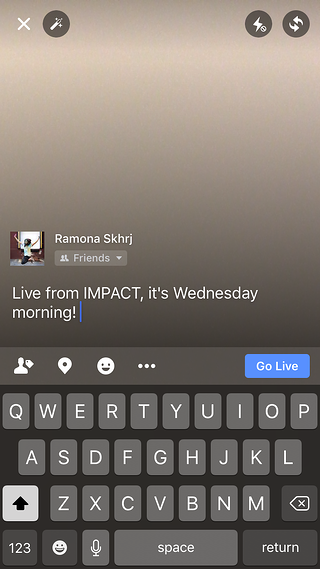 Probably the most common way to start using Facebook Live is through the mobile app so we'll focus on that from an iPhone. If you're using your personal account, look to the top of your screen and click on the Live icon. If you're going Live from your business page, you'll want to navigate to the page, then click on "write something" field to find this button. If this is your first time trying Live, you'll have to give the app permission to use your camera, otherwise, the camera will automatically show you. Don't worry, it won't start recording yet! From here, you can choose your privacy setting to determine who will be able to see your video. Normally, you will want this to be public to get as much exposure as possible, but if you want to do a trial run you can choose "Only Me" in the "More" options. From a business page, this will automatically be set to public and can't be changed. Next, you will need to write a description of your broadcast. Be specific and attention-grabbing. This is all people have to go off of when choosing to watch. Now, before going Live, make sure you're using the right camera on your phone for what you want to record. The background on the screen will show you what the camera sees, so you will easily know if you're on the front or back camera. Once you have your scene set, it's time to "Go Live!" Facebook will countdown for three seconds then your stream will go live to your designated audience. 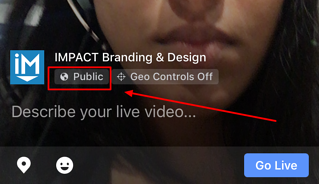 Your live video will show up in newsfeeds as well as on your profile and if people have subscribed to updates from you, they will also receive a notification. As of right now, your Live broadcast can be up to 4 hours long. Facebook recommends staying on for at least 10 minutes, but remember, the longer you broadcast, the more people who are scrolling through their newsfeeds on Facebook will stumble upon your post. Once people start viewing, you want to interact with them as much as possible to get the engagement going quickly. Engagement in the form of reactions, shares, and comments all help your video rise in newsfeeds. The more you speak to viewers by name and reply to their comments, the more active your viewers likely will be, but you can also have another member of your team reply to commenters from a desktop. When you are ready to end the stream, tell your audience goodbye, give them a call-to-action, and click "Finish." Once the broadcast ends, you'll have the option to post the recording to your page, change the audience of this recording, delete it, or save the video to your camera roll for later use. While the platform itself is intuitive, how you optimize a video for Facebook Live is quite different from YouTube. If you've used Periscope in the past, you might already be familiar with the best practices for live video. When you first start a new Facebook Live stream, you should tell the viewers that you want to wait for a minute or two to let others join before you jump into the topic or presentation. In the meantime, you can say hello to those who are already watching and respond to comments on the screen. You can also schedule your broadcast ahead of time so people can opt in for a reminder notification or plan around it. Most of the people who tune in right away already know who you are and what you offer, however, as people like and share your video, others will join in that have no clue what's going on. That's why you should give an introduction in the beginning of the video explaining who you are, what you offer, and other important details about your brand. You should also reintroduce yourself sporadically throughout the stream as your live audience grows. 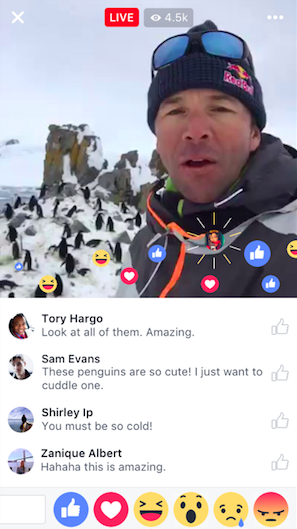 One of the big factors for Facebook Live's success is the personal interaction it offers between the person making the video and their audience. When you respond to comments from people in your audience, you want to use their name like you would if you all were in a room together and the person was wearing a name tag. There's no need for fancy equipment and a recording studio to do Facebook Live. In fact, people seem to prefer the raw, unfiltered approach that live video provides. 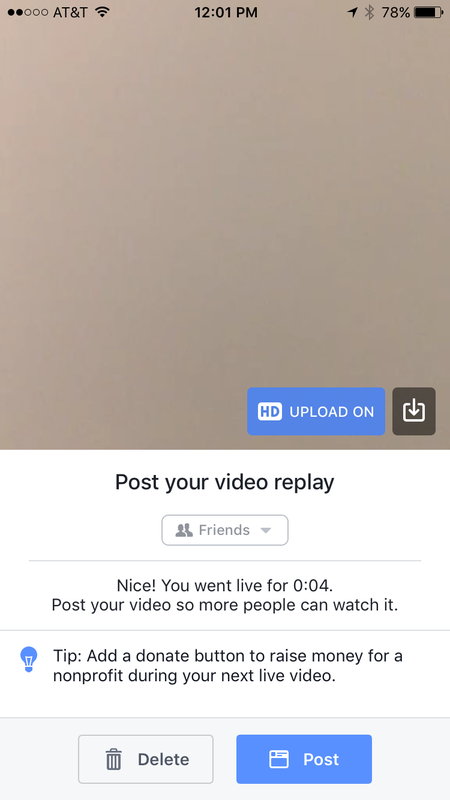 Planned Facebook Live videos are great, but you should also do spontaneous videos where you only give your Facebook audience a heads up 5-10 minutes in advance. Spontaneous videos give your audience a pleasant surprise and encourage them to check your Facebook page often. Just like any other piece of content, you want to encourage viewers to like and share your video. If you're promoting something, be sure to give clear instructions for how your viewers can get that thing at the end of your video. 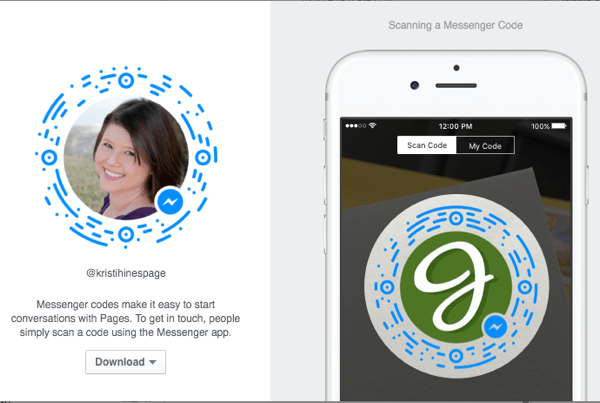 Believe it or not, marketers can also now incorporate Facebook Messenger in their Facebook marketing activities. 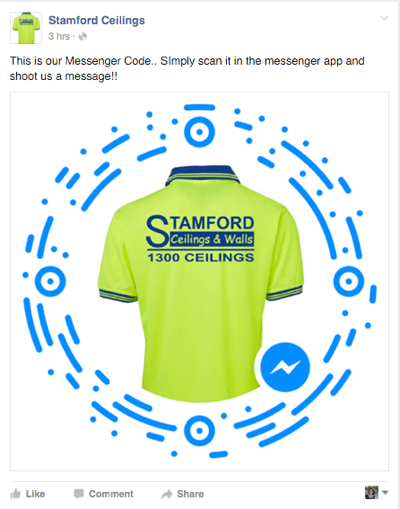 In fact, the social network has started promoting features specifically aimed at helping marketers engage with their audience on Messenger. 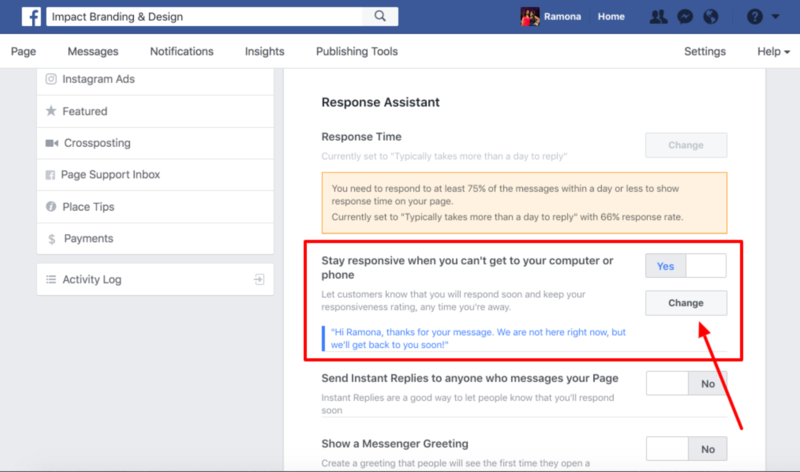 Not too long ago, we published a quick guide to increasing engagement through Facebook Messenger. One of the easiest tactics we recommend is using the auto-reply feature. 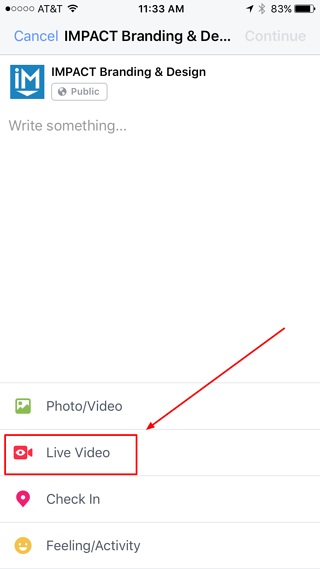 Step 1: From your Facebook business page, click on settings. Step 2: Click on Messaging. Step 3: Switch Responsive Assistant to Yes. Step 4: From here, you can add a custom message. Messenger Codes are similar to your Snapchat profile picture -- they serve as scannable icons that people can use to start a private conversation with you in Facebook Messenger. Social Media Examiner recently explained how this works. To get your code, go to your Facebook page inbox. You should see a Messenger Code icon near the toggle for your away message. 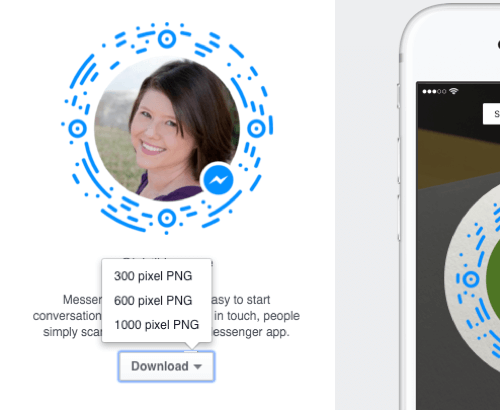 After clicking on the icon, you will then see your Messenger Code with an option to download the image. You can download the image in different file sizes to make it convenient for sharing. Chatbots are the future of customer service and they've picked up even more steam in 2017. You can create a Messenger Bot that answers common questions, shares useful information, and engages with your customers or prospects in many other ways. Unlike bots of the past, Messenger Bots don't try to trick people into thinking they're human, and AI technology has advanced well enough that people don't mind chatting with your bot because it's actually helpful. Want to create a Messenger Bot for free without any coding? Check out Chatfuel. Social media tools are one not-so-secret way that marketers kick their Facebook marketing into overdrive. These tools and apps save you time, provide you with better data, and help you create higher-quality posts and overall experience. Last year, Social Media Examiner shared 44 social media tools recommended by the pros. Below are just a few of the most useful for Facebook from that list. Discover.ly is a free Chrome extension that shows you a contact's Facebook information when you open an email from them on Gmail. This helps simplify the process of finding and connecting with the contact on the platform. 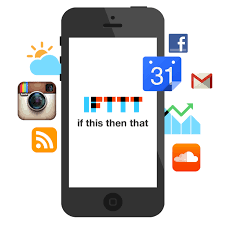 If This Then That is a useful tool that allows you to automate tasks based on certain conditions that you set. 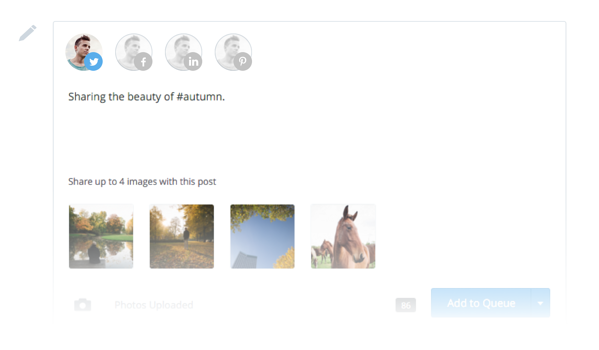 For example, you can set it to automatically repost an Instagram image to your Facebook page at a given time. 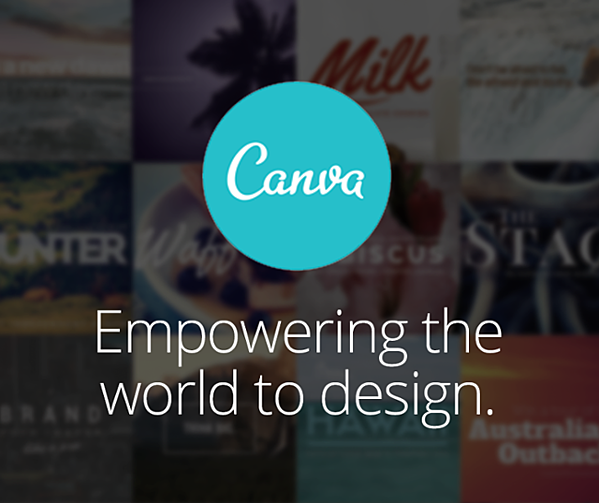 Canva is one of my absolute favorite tools. The free platform allows you to design engaging photos for any of your marketing initiatives and especially useful for social media. Canva has many useful templates (using the dimensions best for display on Facebook) and its drag-and-drop interface makes it easy for anyone to create a professional-looking finished product. Check out our guide to creating a Facebook cover photo with Canva here to get familiar with the popular SaaS. Last, but not least, if you're not on HubSpot or another platform that allows you to manage your social media activity, Buffer is a great alternative. As their homepage explains, "Buffer shares your content at the best possible times throughout the day so that your followers and fans see your updates more often." It's easy-to-use and is an effective way of keeping your Facebook page active without having to post manually every time. In the section above, we shared several tools and discussed the convenience they add to your Facebook marketing efforts, but there is one caveat we need to discuss. When it comes to automation, less is more. In other words, automation can end up backfiring on you when overused. 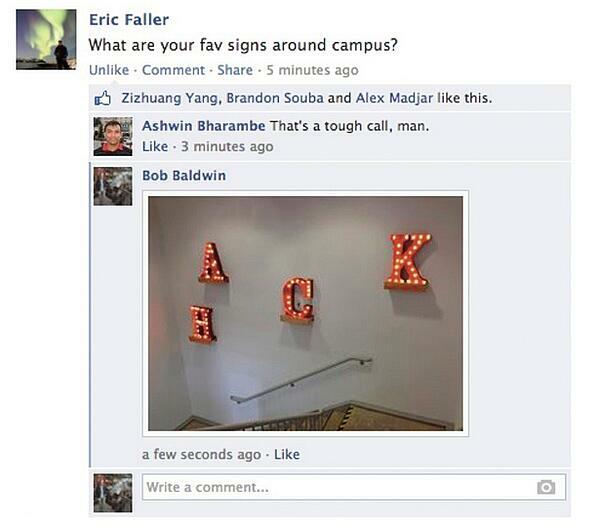 Facebook is primarily a platform that people use to keep in touch with their loved ones. It's a personal, human space and in order to "fit in" and make a positive impact there as a brand, you must take a personal approach. Only posting automated messages, self-promoting, and never engaging is the social media equivalent of "phoning it in." To be successful and boost Facebook engagement, you need to talk connect with people on a human level. Answer their questions, ask your own, and show them you are listening. Post things that will not only educate but enlighten and entertain. Here are a few of the types of posts that get shared the most on Facebook, according to KissMetrics. When it comes to Facebook marketing, B2B marketers often say "well, that only works for B2C brands..."
But this simply isn't true. In fact, KISSmetrics published an article, 4 Strategies For Engaging Facebook Fans No Matter How “Unsexy” Your Brand Is, that should clear any doubts you have about B2B marketing on Facebook. Some brands are resistant to sharing content created by their competitors, but it ultimately has a positive effect. By sharing the best content from any source you become the one-stop-shop for the information your buyer personas care about. Once your fans rely on you as their go-to source for information, your Facebook engagement will organically increase because they'll visit your page when they don't see your posts in their newsfeed. Sharing others' content also shows that your brand is helpful, not just going out for the sale. There are certain things that all of your buyer personas can relate to -- like paying bills or getting stuck in traffic. By posting highly-relatable content, you are more likely to get engagement from your Facebook fans. You don't have to be extremely creative or original to get people engaged with your Facebook posts. You simply need to build a connection with people and show that you understand them. You can always tell which company at a trade show is giving away the coolest stuff, because their booth is the most crowded. The same strategy works on Facebook. Facebook contests and giveaways are highly effective for creating brand awareness, generating leads, and growing your presence on the platform; you just need to ensure that what you're offering is unique and truly valuable. Expanding your empire might be a worthy cause for you, but other people are less likely to feel passionate about it. If you want a sure-fire way to connect with your buyer persona on an emotional level, support an initiative or charitable cause they care abou. When you show genuine effort to support an initiative and align your brand with a noble cause, people often want to be in your corner. They will that by supporting you, their efforts are being returned to the cause as well. 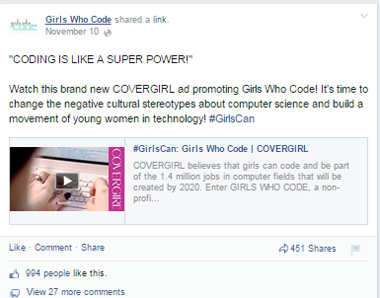 Let's face it, we all judge Facebook brand pages by the amount of "likes" they have. Nothing says small-time like a brand with less than 100 Facebook fans, am I right? Those first 1,000 likes are the hardest to get, but it doesn't take too long when you have a few tricks up your sleeve. Below are some useful tips for driving more Facebook likes that never go out of style. Engagement is integral to successful Facebook marketing-- more so than a number of people you reach. An engaged audience is an audience that is more likely to buy your products or services or recommend it to their friends. Since Facebook limits a number of people who see your updates organically, you have to keep them actively engaged with them using the tactics above to make it into their newsfeeds. Getting your initial fans might be a challenge, but once you build your audience, attracting an ever larger one is an easy win.